GPS - McKercher Park Falls, 135m el. I-5 Exit 216 onto Hwy 228 and head east. Small waterfall is visible down the trail about 100 feet east of the park. And, 100 feet futher east on 228 is a widespot for parking - at the falls. Waterfall is located in a picturesque location with a nice park and scenery to match. 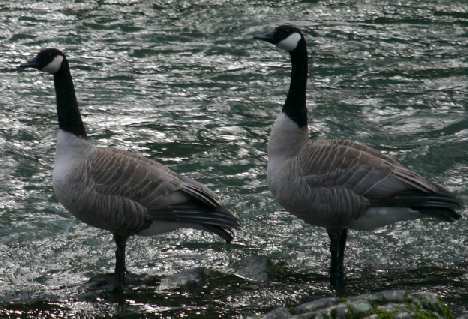 These Canadian Geese were carrunking at other geese upstream of the falls.